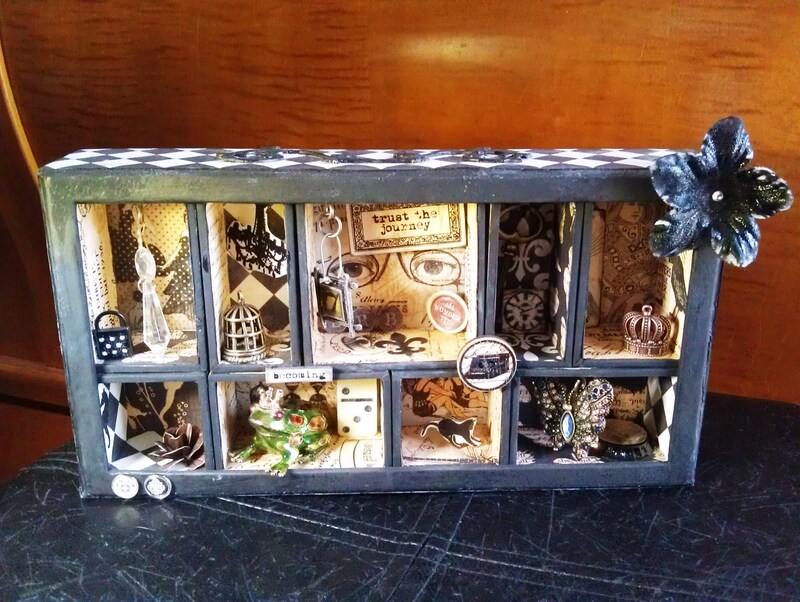 Lots of options for creativity with the Tim Holtz configuration box. This is the first Configuration Box I’ve created. I actually created it a few months ago and keep it on my desk for inspiration. I used my favorite color combination, black and white, plus some embellishments that have meaning to me: seahorses, butterflies, birdcages, cats, chandeliers. I also have a few Parisian references such as the Eiffel Tower (kind of hidden from the angle of the photo) and a fleur de lis, since I am planning a trip to France later this year. The green frog prince is a gift from a friend. Since the top half of the frog lifts open to place a little suprise, I keep him unsecured so I can remove him as needed. I also created a Christmas configuration box, which I will show later as it gets closer to the holidays. I plan to create more configuration boxes as gifts. I collected quite a few when Michael’s had them on clearance last year. They’re by the Tim Holtz line and can be rearranged and decorated pretty much any way you want. Lots of options for creativity!